Poker losing streaks represent the incarnation of necessary evil in poker.Regardless of how good and lucky a player you are, you will hit a snag in the road sooner or later, and you can take that pretty much for granted. Poker is a game of variance. You win some and you lose some, and your goal as a successful poker player is to balance things so that at the end of the day, when you add up your wins, your losses, your rakeback, your sign-up bonus and who knows what else, you should be above the dreaded red line. If you can achieve that, you’ll be a successful player. 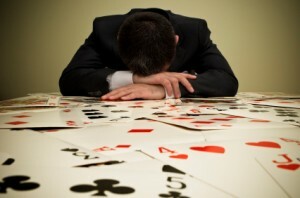 Dealing with poker losing streaks seems pretty simple on paper, however, due to the emotional intricacy of the human race and to the often perverted ways poker finds to put one to the test, it is not nearly as simple in practice. That would explain why some of the top poker professionals (and I’m thinking about Phil Hellmuth and Mike Matusow here) have such a tough time handling poker losing streaks. If these guys can’t do it, what chance do you – a mere commoner – stand? Successful poker and bankroll management hinges on one thing and one thing alone: knowing when to quit. If you become adept as quitting in the right moments, you’ll be able to handle your losses better than anyone else. As a general rule, as long as you play well, and as long as you keep piling up those “Sklansky dollars”, you shouldn’t quit. managing poker losing streaks is to just stop playing once you realize your judgment is clouded. Being able to stop at the right time though, means that you need to be able to manage your emotions. Often when hit by losing streaks, players fall into a sort of mental rut, which ends up prolonging their suffering. Tell yourself that it’s all math, and as long as you’re still amassing Sklansky dollars, you’re going to come out a winner on the other side of the tunnel. It is interesting to see how many players manage their emotions badly. They let despair take over when hit by bad beats, and they begin to fear that every time they shove those chips into the middle, they’ll end up watching them shipped in the other direction. Just take a look at the posts in a poker forum, you’ll see what I’m talking about. This kind of thinking brings about more trouble as it interferes with the optimal decision making process. Staying upbeat is easy when things are going well. Keeping a stiff upper lip is much more difficult when under assault by Lady Luck though.